Accomodation at d’Omah is spread over 5 hectares of tropical gardens and pools. There are our heritage deluxe rooms and two or three bedroom compounds all with easy access to swimming pools and all incorporating examples of local contemporary art combined with Javanese antiques. 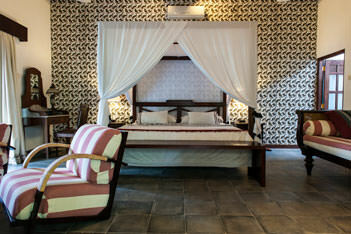 A lavish use of traditional batik on the walls and furnishings is featured in all rooms. Lush gardens provide privacy for relaxing and total tranquility. All this combined with facilities expected in any hotel of class such as air conditioning, WIFI and international TV, provide a standard of the highest convenience and comfort for you to enjoy. Our deluxe heritage en-suite double bedrooms feature individually striking Jogya batik fabric décor, creating the perfect environment to chill, relax and savour being surrounded by the unmistakably Javanese inspired ambiance. 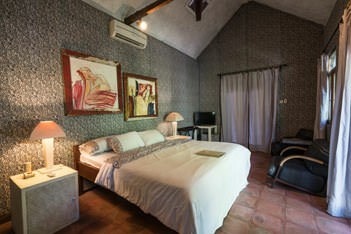 Each Deluxe Heritage room is tastefully furnished and has a range of high quality guest amenities. Easy access to our swimming pool adds to the overall d’Omah Village Resort experience. The perfect room configuration to share the secret of one of the most unique, stylish and authentically Javanese boutique hotels in Indonesia. 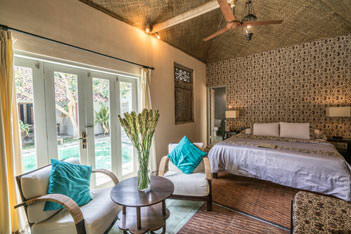 Featuring our signature Javanese batik décor and traditional furniture, your two-bedroom, en-suite villa provides comfortable indoor and outdoor areas where you can relax or entertain. d’Omah Villas – Traditional Javanese architecture and modern day guest facilities together in perfect harmony. Families or friends feel perfectly at home in our impressive three bedroom villas. Soak up the seclusion of your private Javanese villa, or share the unique d’Omah experience with friends or colleagues. Our en-suite villa bathrooms feature a large bath and separate shower, and all bedrooms have air con, digital TV, wi-fi and mini-fridge.